And so my problem was solved as soon as I replaced our Wireless G router with the (new) Wireless N router to connect our Samsung Galaxy Tab 7.0 Plus to our home network. I bought the D-Link brand (DI-600) that replaced our old D-Link (DI-524) Wireless G router. The difference between the two, I was told, aside from the “N” and “D” labelings is the “N’s” stronger frequency signal (*and some other good stuff only nerder geeks would know – by the way, that’s a compliment). I am also guessing that malls and shops I was able to connect my Samsung Tab to were probably using Wireless N routers. Remember, you need a more powerful router to connect wireless devices to the internet. This research I made turn out that my Samsung Tab is Wireless N ready. It was nerve-wracking to spend about US$40 for a router we do not need but it’s the only “answer” I have. After buying the router at a nearby Silicon Valley store, I was able to finally connect our two Samsung Galaxy Tabs, our iMac, and our Toshiba Windows 7 notebook without a hitch. So there goes your “un-techie” answer to those who are having home network connection problems with their newly bought Samsung Galaxy Tab 7.0 Plus device. 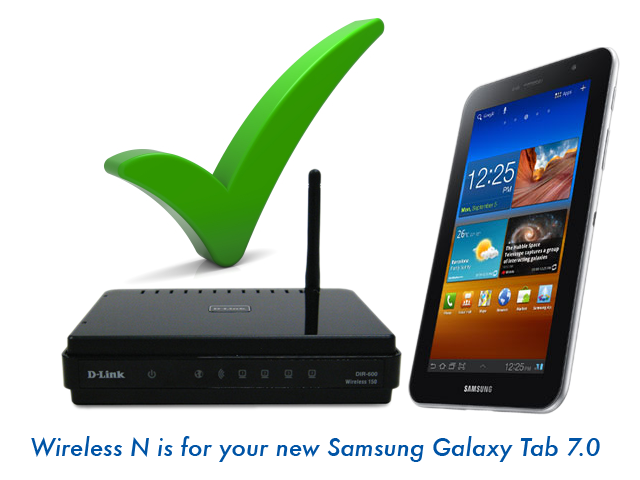 The problem is with the router – not with your Galaxy Tab. Previous PostCould a Wireless N router fix my Galaxy Tab-internet problem?Next PostHuawei 3G tablets have landed! Thanks for useful informations. I’ve been having the same problem. And my router is ZTE AR450 supplied by the provider. I suspected that something is wrong with the router because my Galaxy 7.0plus was fine with other WIFI router. I am not sure what is ‘G’ and what is ‘N’ and have no idea how to find out about it. And the option is to buy a new “N” router soon. Thanks again. I am using a Thomson router, at first i managed to connect go the router’S WIFII, however now My galaxy 7 tab 2 can not even detect the my wireless network. Fantastic help from this posT. Had only just received Virgins SuperHub after complaining for over a year of intermittent bb loss. New Superhub is wifi only G rated and I need N for my SAMSUNG TAB2… they are now replacing with N rated equipment. Pity they werent listening properly when i said my devices were all wireless. THANKS SO MUCH FOR YOUR.POST IT HELPED ME LOTS. I have a belkin 300N router. My tab use to connect to it fine. Now it doesn’t. I’m not sure it is just about being an ‘N’ type router. It worked for me. I hope you find the solution you’re looking for. Share if you can to help more people. Thanks. We turned on the wireless connection on both and checked that they could connect to the internet and worked at a decent pace. I agree but you see, this is my experience and it may be different for others. I hope it turns out well for others too as they read my experience. Good day! Thank you very much. I will do as well. There’s definately a lot to find out about this issue. I like all of the points you’ve made. Thank you. I didn’t know it’s going to be this helpful. I’m glad it did. believe. It has a 2-megapixel rear-facing camera and a 5-megapixel front-facing one. Being a computer and laptop manufacturer, the company jumped in tablet PC market soon after they came into market. That’s right. Thanks for reading my blog. Enjoy your day my friend. To buy a new router? EAT MY PANTS!!!! I’ll better change my device by using its guarantee instead of spending on additional toys. By the way, it was connecting fine till these days, so might be there is an OS update problems as said on tech forum. Well, me eating your pants won’t solve your problem either. I hope you find the solution that would connect your phone to your router soon. Happy day! “The problem is with the router – not with your Galaxy Tab.” Oh thank you, thank you! I was dumb not to figure this out myself. Haha! Tab’s all good now. Yayy!! Nice to read from you katkat. We hope to help you more of your problems soon.